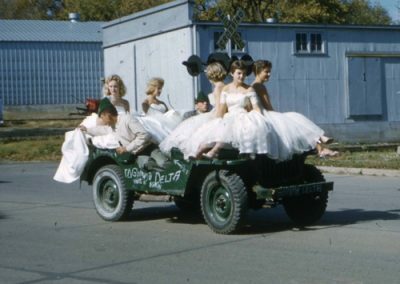 Where else but in a homecoming parade do you see female students in puffy pastel crinolines perched on an Army jeep, or the physics club’s gigantic “Amazon Queen of Science” float? 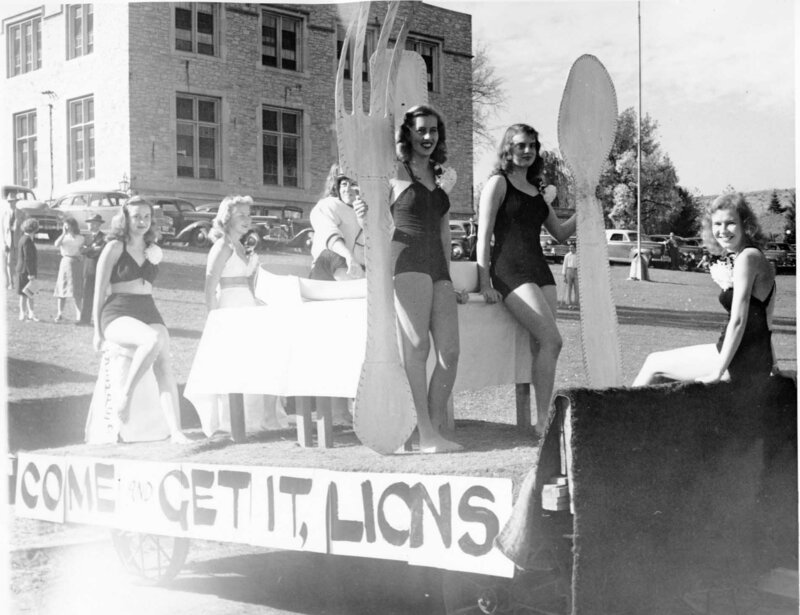 In the decade-plus following World War II, Oles crafted chicken wire and crepe paper into colorful and sometimes outlandish floats like Knox Tail Soup (featuring a steaming pot), or a student dressed as the devil holding a placard exclaiming, “To Helge with the Carls!” (referring to St. Olaf’s head football coach, Helge Pukema). 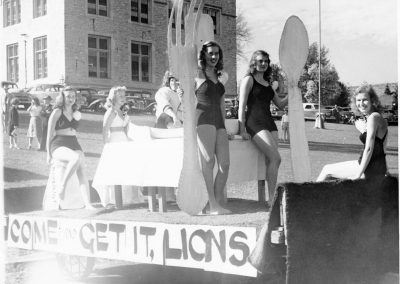 In honor of the college’s seventy-fifth anniversary in 1949, the Homecoming theme, “Shining in ’49,” was wishful thinking. Unfortunately, chilly temperatures hampered the day’s festivities. The women’s Dolphin Swim Club, sitting atop a float clad in their bathing suits, succumbed to the cold and donned fur coats; the following year they would redeem themselves and win first place in the float competition. The parade, with a then-record forty-three units, stalled behind two floats with flat tires. And if that were not enough, the football team got stomped by Gustavus, 20 to 0. A few years later, the 1953 parade included 500 ROTC cadets and the Zumbrota High School marching band making their way from Lincoln Street to Division Street and returning to campus via Lincoln Lane. Floats entered Manitou Field and streamed past the grandstand filled with thousands of people and several judges, who awarded three cash prizes of $15, $10 and $5. 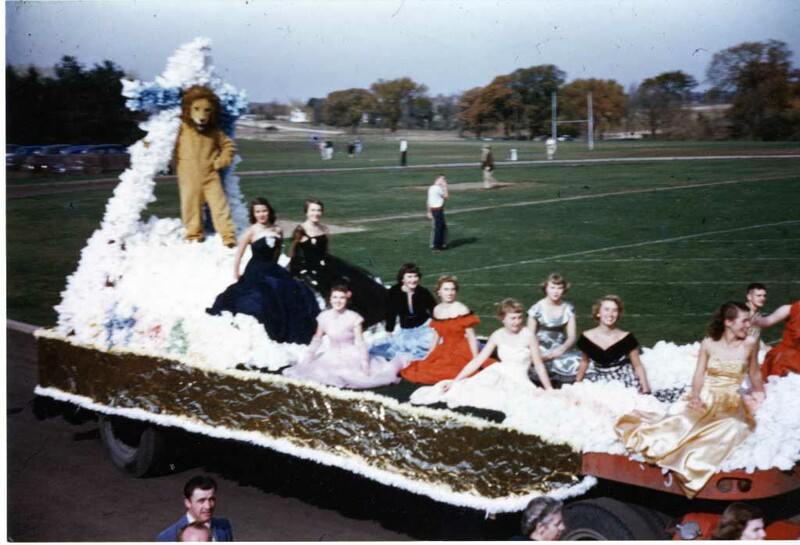 By the early 1960s, elaborate floats were going out of vogue at St. Olaf. 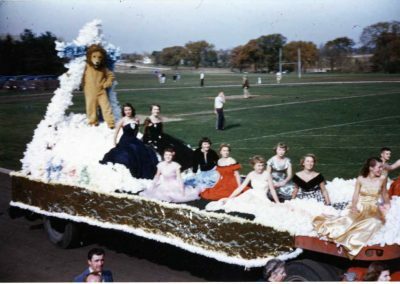 In 1963, the Homecoming parade was dropped in favor of an all-school picnic. 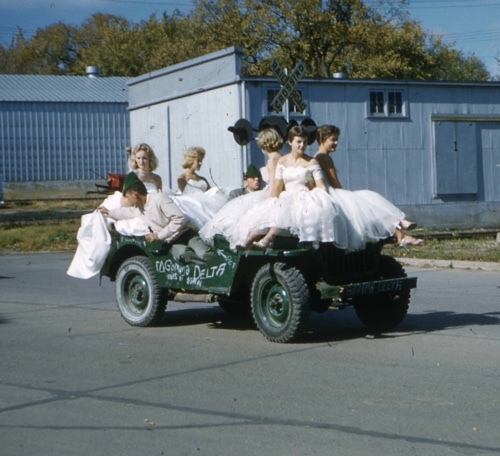 It was not until 1968 that the Homecoming parade resumed, but alas, crinoline was no more. Where else but in a homecoming parade do you see students wearing puffy pastel crinolines? Today, the field and track no longer pave the way for a parade of Oles, but are home to exciting football games and track events. 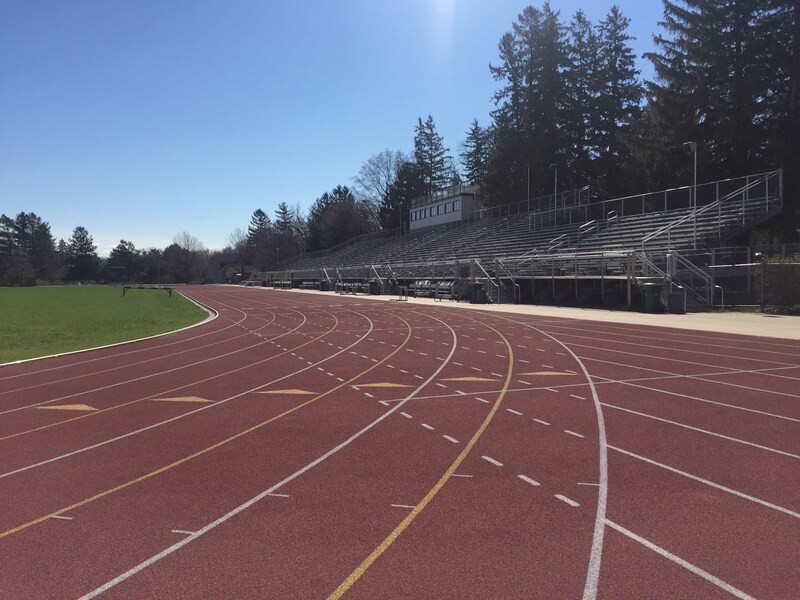 Come and Get It Lions!